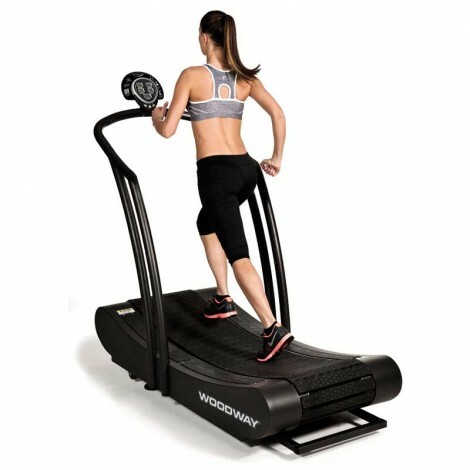 The Woodway Curve is a unique, self-powered treadmill that challenges your body in ways traditional treadmills can't. With its patented curved design, you can target more muscles and burn up to 30% more calories. The Curve features a basic round display showing your workout stats, full handles to grip where you want to and no plug so you can place the machine anywhere you'd like and not have to worry about a source of electricity. The experts love the Woodway Curve and the reviews have been very favorable thus far. Although it is not a residential model (none of the Woodway treadmills are) you'll see more and more of these cool-looking machines in home gyms these days. People use them at the health club and fall in love with them, and if they can afford it, they buy one for the house. The Curve is unique in that it is the only self-powered model in the lineup. You control how fast you go, and you can do pretty much any type of workout on it, from a leisurely walk to a high intensity interval workout. Instead of fumbling for a button to change your speed, you simply run faster or slower...it's very simple. 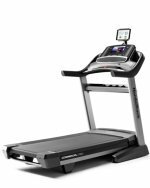 The Curve has a special Slat Belt that is made up of 60 individual slats, unlike the single belt of a traditional treadmill, which helps it glide very smoothly without the usual friction. It is also maintenance free for up to 150,000 miles, which is unheard of in the exercise equipment industry. So although the Woodway Curve is pricey, at anywhere from $8000-$10,000 new, the savings you get from not having to use electricity or maintain it make it a very wise choice. Although the display is quite basic, you can measure your heart rate wirelessly and upgrade software to better monitor and track your workouts. For those who prefer to walk or jog, there is also a Curve Trainer with less of an incline, and there is a Curve XL for taller/bigger athletes. The Woodway Curve is a very cool treadmill, offering something different than the traditional experience. It feels rugged and durable, yet smooth and natural, and you can run as fast as you want to without having to change any speeds on the machine. Sure, it's very pricey, and likely out of reach for most of us. But if you have the budget, the Curve will last for years and years with little to no maintenance required. Take a look at the popular 4Front as well for a little more versatility. It has a motor, incline capability, a more advanced display and additional features that the Curve does not.